So that makes it a good place to die prematurely? Familiarity breeds contempt. For instance, three young adults drown in one tragic incident several year ago. They were raised in the area, travelling that lake hundreds of times, as recently as earlier that week, and had done some ice fishing too. But a different combination of elements opened water around an abnormal pressure crack and much to the shock of everyone, it was game over. My own cottage is on a small lake where you can’t lose sight of shore. One night, I took some guests out for a short tour. Blowing snow began, disorienting me. After a brief panic, I found the shore and followed it home. We were lucky that night, but the disaster potential was that the others would have followed their lost leader anywhere. You can never be too sure. 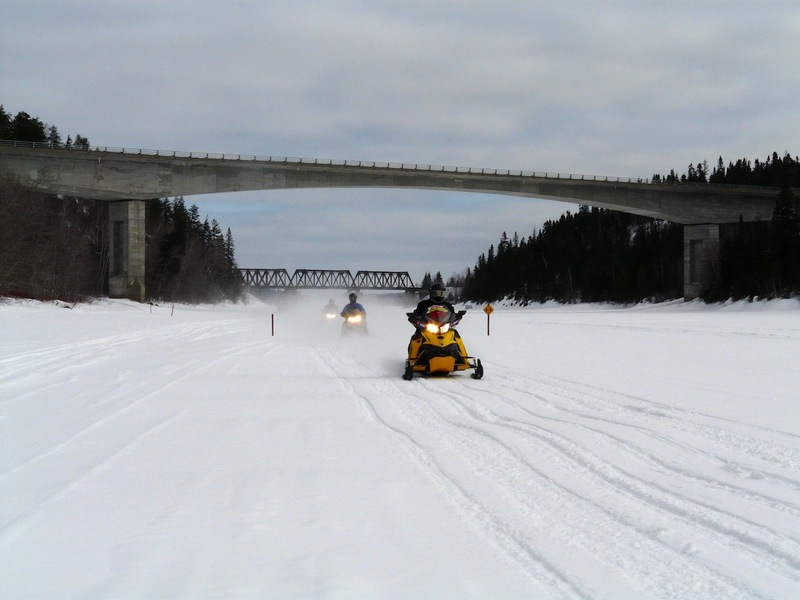 Many snowmobilers have a false vision about going through the ice. 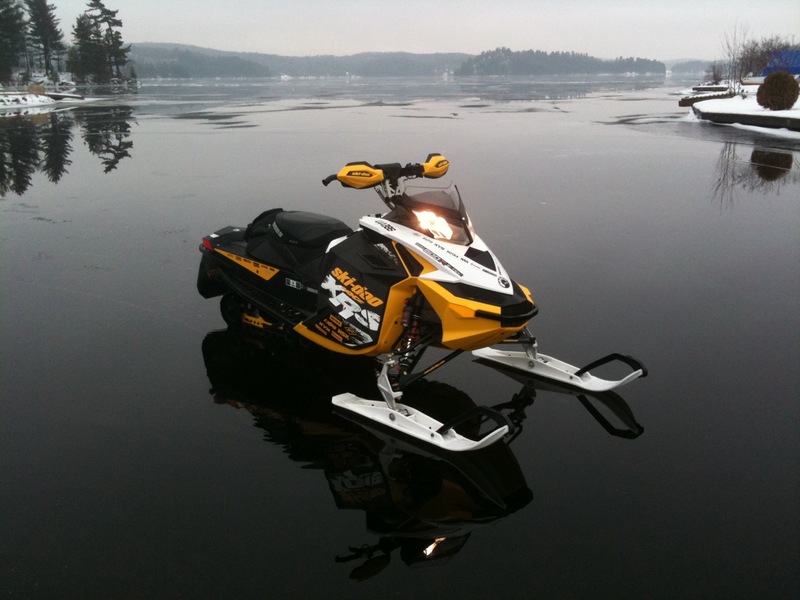 Consider several chilling facts: often drowning occurs when a rider hits open water at high speed. How far from the ice edge does that moving sled carry you? What damage occurs when you hit water too hard? When you sink, how do you know which way is up? If you do surface, which way is safety? How long can you tread water? 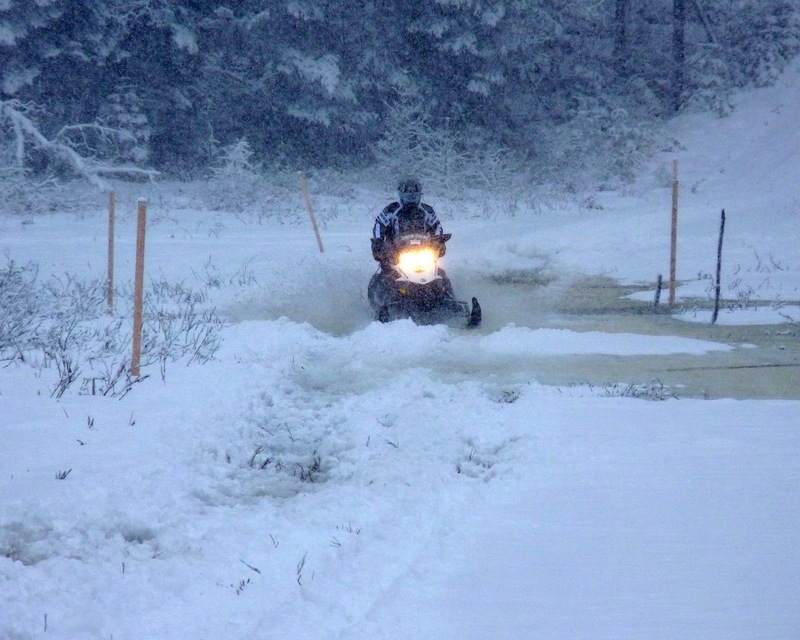 Hope that no other speeding snowmobiles follow you in, because odds are good that one will crunch your head as you come up for air. And if you break through ice, your trajectory will probably be at an angle away from the entry hole. If you’re very lucky, and there’s no current, maybe you’ll find the hole again before your next gasp for breathe. 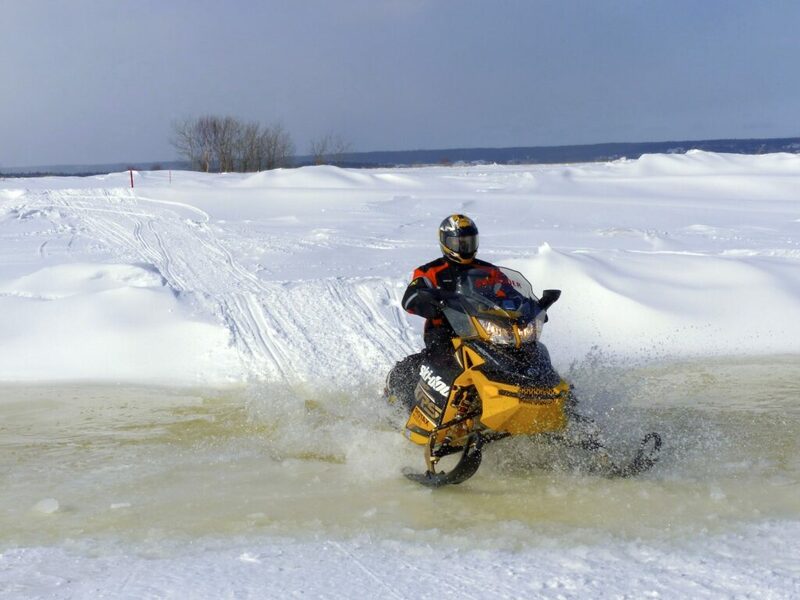 Maybe — if you don’t panic when your helmet fills with ice water or when your body’s involuntary shock gasp water logs your lungs or when you don’t know which way is up. Don’t under estimate the weight of soaked snow gear. And the cold will sap your muscle power faster than you ever imagined. Strong or not, you’ve got less than a minute before you start to lose it. One strong man drowned in less than five feet of water. Don’t count on it. They may go in too, or worse, not even miss you in the dark. They may not have rescue tools. Or they may be too scared or panicky to act fast enough. Going for help will likely take too long. 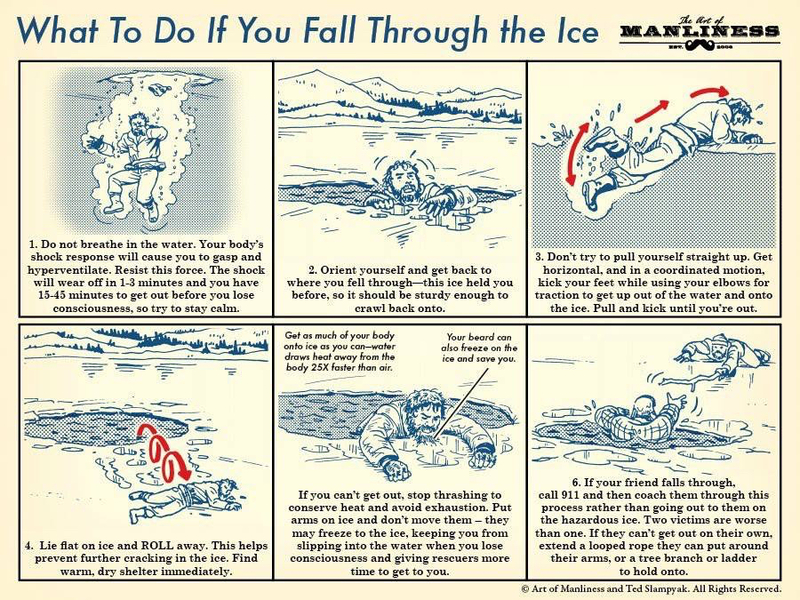 Often, local police, fire fighters and paramedics are not trained in ice rescue. Without it, they are frequently forbidden to help, for safety and liability reasons. With cutbacks, their availability is restricted. Besides, most ice tragedies don’t happen close to such assistance. You’re on your own. There’s no doubt flotation will help, but it won’t get you out of the water. So unless there’s help, you’re still on your own. You may not drown, but if you can’t get out (and it’s not easy), hypothermia will likely kill you. At least your corpse will be bobbing for easy retrieval. It’s not that easy to extract yourself. As the cold saps your strength and dulls your mind, you have only seconds, so use all of your power to kick your legs and heave yourself out like a seal — and hope you can get a grip and that the ice edge holds under your weight. The bad news is that if you succeed, hypothermia will quickly kill you unless you can warm your body core immediately.